Vibrant Health’s Green Vibrance has won Vitamin Retailer’s 2018 Vity Award in the Green Food Supplement category. Vibrant Health, a leading manufacturer of dietary supplements for over 25 years, is proud to win one of the most sought after awards in the natural products industry for many years. The 2018 Vity Award is the 14th award for Green Vibrance. Vitamin Retailer‘s annual Vity awards select winners based on health food retailers reports of what their customers are buying, making the end consumer the judge and jury in this prestigious contest. Once polls close, Vitamin Retailer selects the given year’s Vity award recipeints by highest number of retailer votes per category. 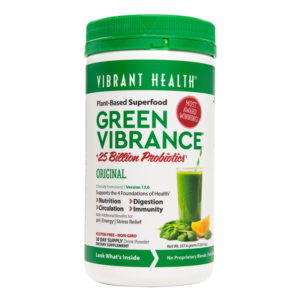 Green Vibrance, Vibrant Health’s flagship product, has lead the way in the green superfoods industry and has won an impressive number of awards since its launch in 1992. Green Vibrance is a concentrated superfood that’s more than a ultra-comprehensive greens powder: the formula aims to make consumers healthier and stronger. The superfood supplement is designed to feed each cell with what it needs to run at its best, supporting a strong immune system, a robust gastro-intestinal tract to draw in complete nutrition, and a healthy circulatory system to deliver those nutrients. With small batch production, full disclosure labeling, and Mark Timon leading as Vibrant Health’s fearless formulator, the company has held true to its creed for over 25 years: Truth. Trust. Transparency.™ Vibrant Health respects the consumer’s right to know what goes into every product, by disclosing the exact weight of each ingredient in every scoop, right on the label. Consumers can simply take a look at the Green Vibrance bottle to find out what top-quality ingredients are inside. To celebrate its 25th year on the market, Vibrant Health has released two customer-selected flavors to enhance the Green Vibrance line: Chocolate Coconut and Matcha Tea. These two flavors simply build on the foundational formula, offering a decadent, low-sugar option for those less initiated to green superfoods. Vibrant Health credits a quality product, a skilled team, and our retail associates with the notable 2018 Vity win.